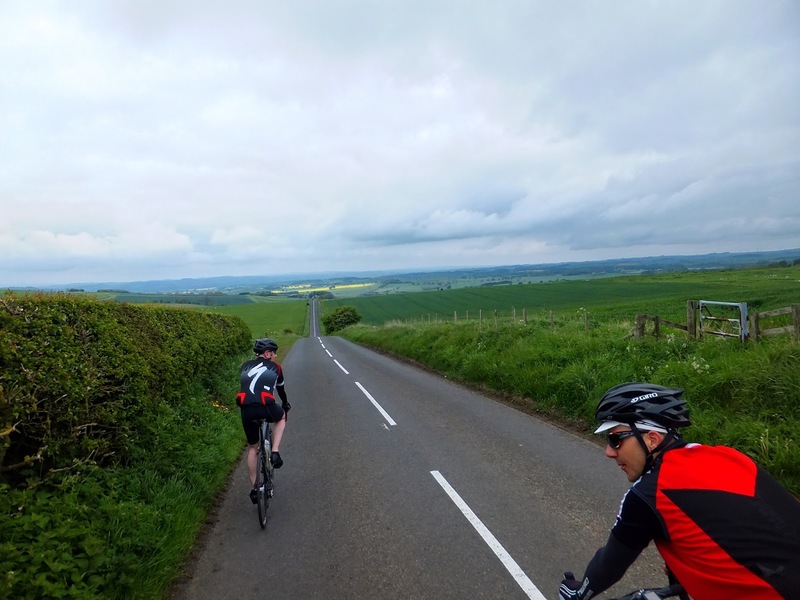 Day one started at the genteel hour of 8am; Paul and I set off from Durham following the A167 to the Angel of the North to meet the others enjoying this ‘Washington to Moscow’ journey. I’ve written about the route in detail, there is no need for me to describe it too much in this journal entry. 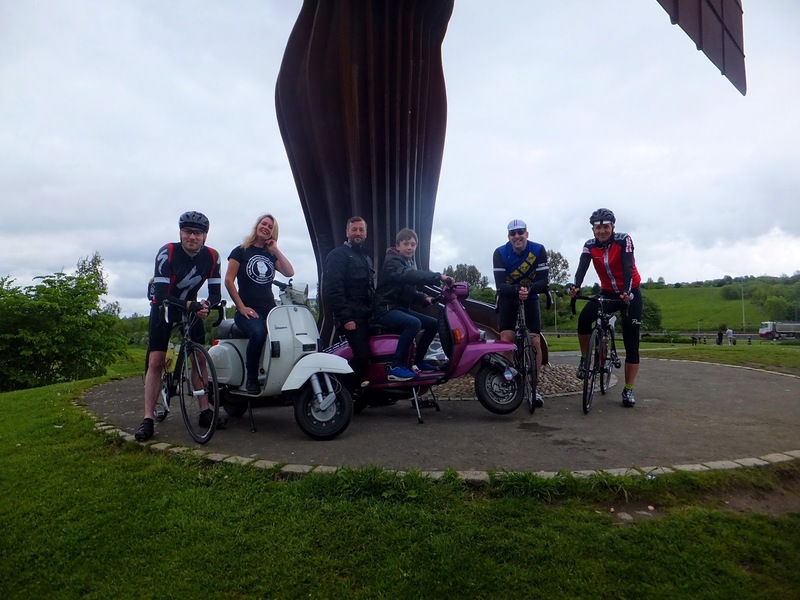 We gathered – Scooterists and Cyclists – at the feet of the Angel of the North for our starting photograph before heading north into Gateshead and Newcastle. Scootering the route were Luke, Jenny and Euan. Cycling were Bobby, Paul and I. Kay was providing support from the car, because the torn tendons in her arm were preventing her from cycling with us. 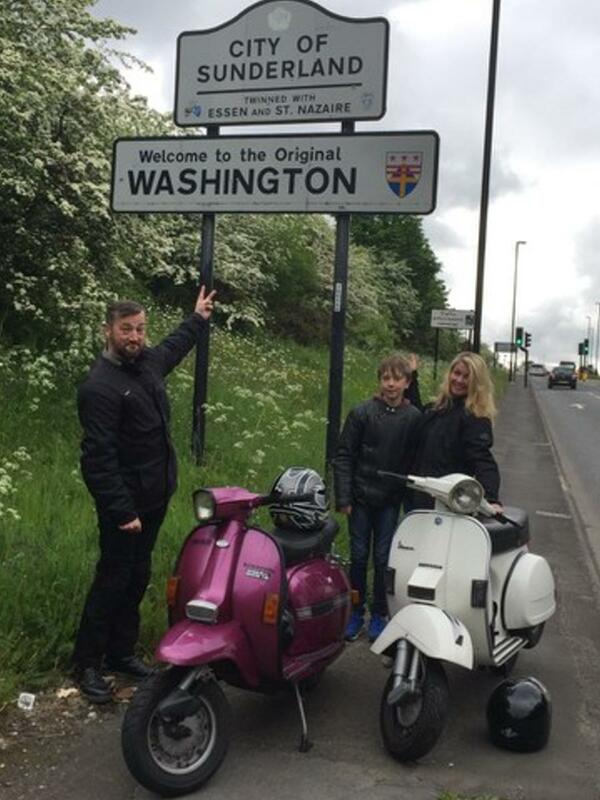 Now I know the Angel of the North isn’t Washington, but the busy A1 and the A194(M) lay between us, so our Scooterist friends did the 5km trip to pay their respects; we just set off north through Gateshead. My route finding kung-fu was weak, and with the little gps device losing its signal I found navigating Newcastle frustrating. I don’t mind getting lost on my own, but when you’re responsible for leading others it’s embarrassing weaving around and doubling back. After 30 minutes cycling we found a drive-through coffee shop for a quick comfort break, but didn’t stop for longer because the edge of the city was in sight. I gave a little cheer as it became obvious we’d escaped Newcastle – and that was to be the last bit of busy built up riding until we reached the end of the day in Hawick, 80 miles up the road. 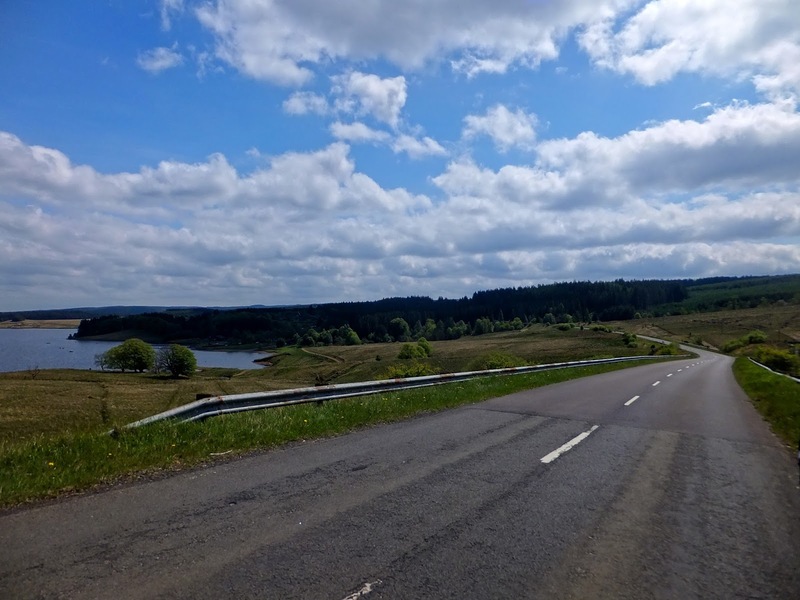 Once out in the countryside we were enjoying almost deserted roads. 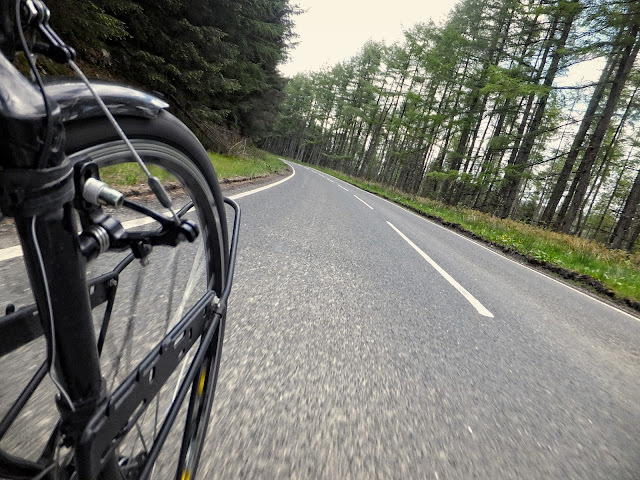 The one or two cars that passed were not a problem and we had the freedom to enjoy cycling side-by-side and being immersed in the green Northumberland scenery. 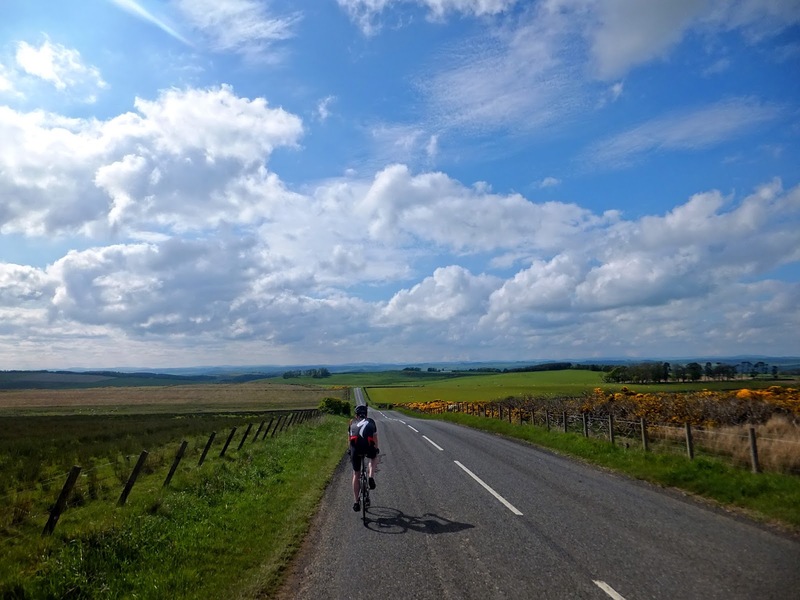 After Stamfordham and Fenwick, we hit the top of the Ryals and hurtled down towards the A68, over this main road and onwards to Wark at 55km (33 miles). We crossed the River Tyne North and met up with Kay to refresh our water bottles. I’d never ridden with Bobby before, but this ride was his brain-child and we’d liaised through the internet to plot this route out. Paul and I have ridden together a lot in Teesside, he’s a strong fast rider compared to my endurance engine, and although we didn’t know Bobby personally there was something excellent about finding a harmony that worked between us. After Wark we rode alongside the River Tyne North and followed in upstream to Kielder with our second stop of the day, for lunch, at Falstone. Paul has ridden the Chevy Chase and knew where we were but this was totally new territory to Bobby. Today’s weather was just right so far, overcast but warm. The ride alongside the Kielder Reservoir was also essentially traffic free as it undulated ever higher. The Dark Skies of Kielder allow some jaw-dropping views of the stars at night but for us this was the middle of the daytime. 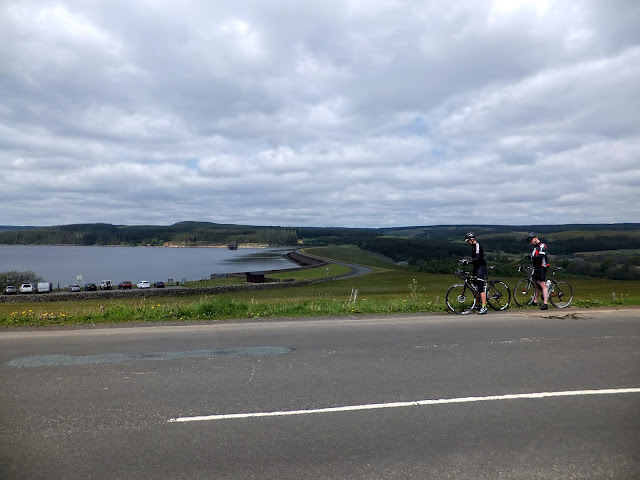 We rode past the Observatory and continued north, drawing towards Kielder village, onwards and upwards and eventually reached the top of the valley and the border with Scotland. 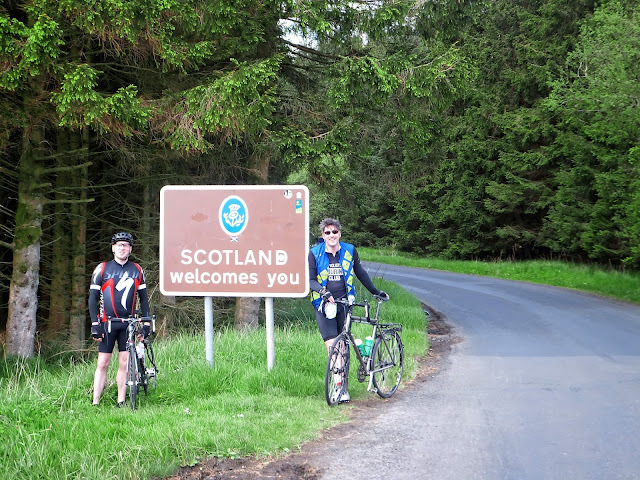 Bobby is a true Scot, so we asked his permission to cross the border and continue. 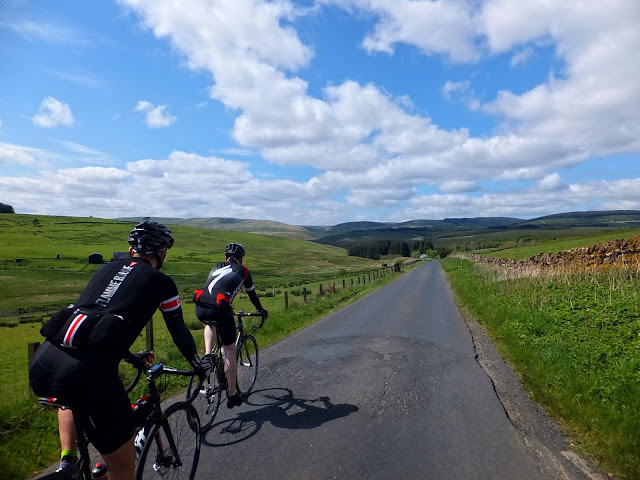 Once into Scotland the roads became – if possible – even more scenic and beautiful. We whisked along fairly downhill to Saughtree where we’d arranged to meet Kay, only to discover that Saughtree is a church and a manse. Nothing else. We laughed about this being the greater metropolitan district of Saughtree and continued northbound heading towards Hawick. The road started to climb again, but with the long gentle Scottish slopes which felt almost alpine. 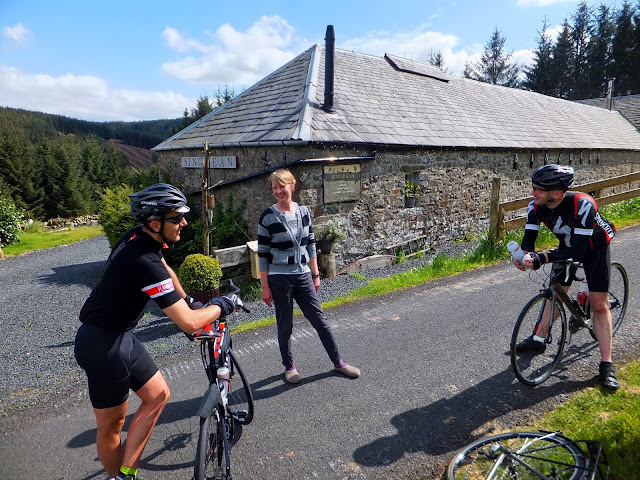 After one particularly long climb, Kay waved at us from the side of the road; she’d found a B&B where we could refill water bottles: Singdean. This B&B has hot tub and sauna – so I’d like to bring Carol back here – there is a distinctly Scandinavian feel to the place. Our host stopped work to spend a few minutes chatting and we rested in the quiet contemplation of this beautiful place. We still had a long climb ahead of us, but we’d been told there was a pub in the next town so found the energy to push on and crested the hill to yet more amazing views – and a fast descent to the ‘Horse and Hounds‘ in Bonchester Bridge. Although it hadn’t been cold outside, we relaxed in the warm of the pub. 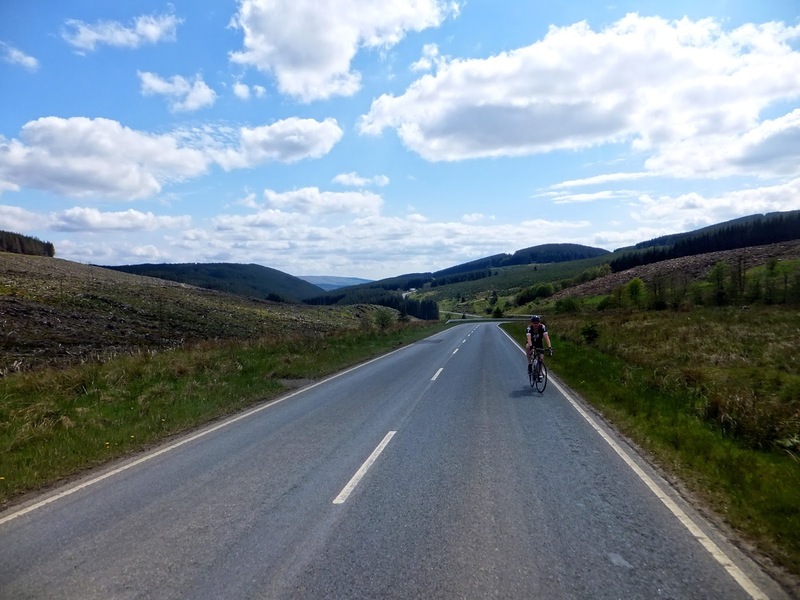 There was just 12km (7 miles) remaining to reach Hawick and it was still quite early. Paul talked of pushing on, but the reality was that we had accommodation and the Scooterists had already arrived. Bonchester Bridge is beside a river – funnily enough. So the first thing we had to do with cold legs and a belly full of beer, was climb again. 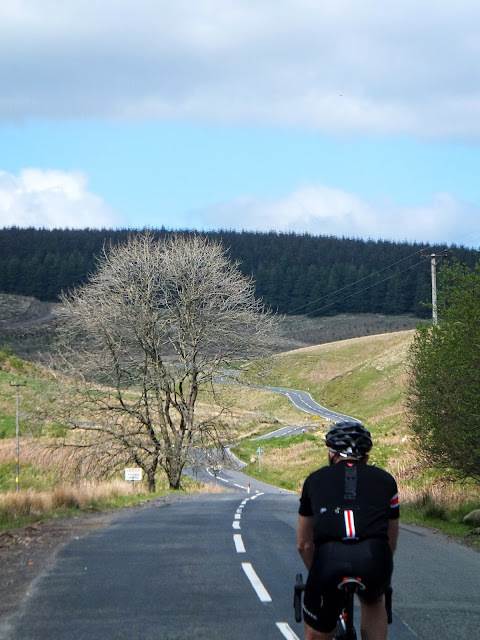 Up and up before the last wide open descent of the day into Hawick. We’d made it. 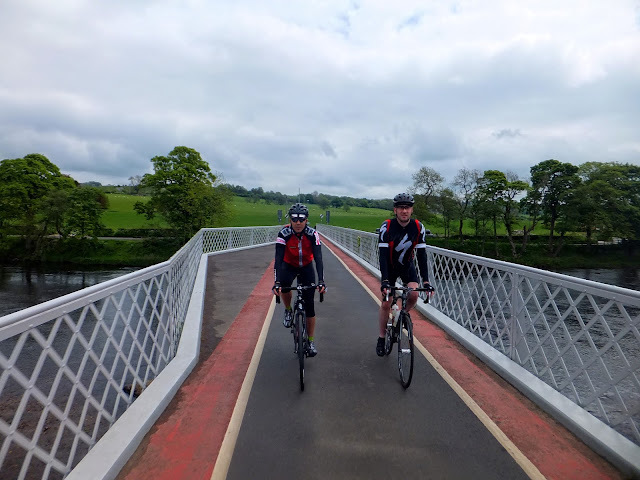 Durham via the Angel of the North to Hawick: and barring the urban start we rode on roads with little or no traffic through the gorgeous northern countryside of Northumberland and the Scottish Borders. We’d booked into the Bank Guest House – which was a touch of luxury at the end of this long day. 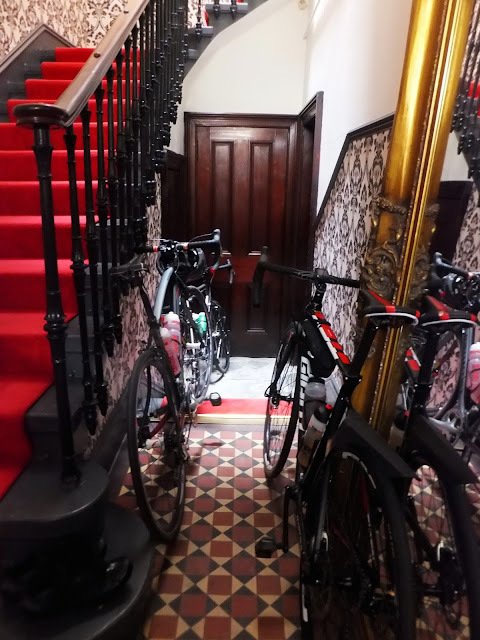 The bikes were offered a comfortable night too in the sumptuous lobby. We headed down the street to the ‘Spoons for burgers and beers. I promised Bobby and Paul that ‘Day 2’ would be flatter and easier. Lovely recap Graeme and some great images.